Although I started with an A3 piece of paper, I decided to crop it to a square as this suited the composition better. I decided to look down onto the bowl for a change of perspective this time and really like how it has turned out. 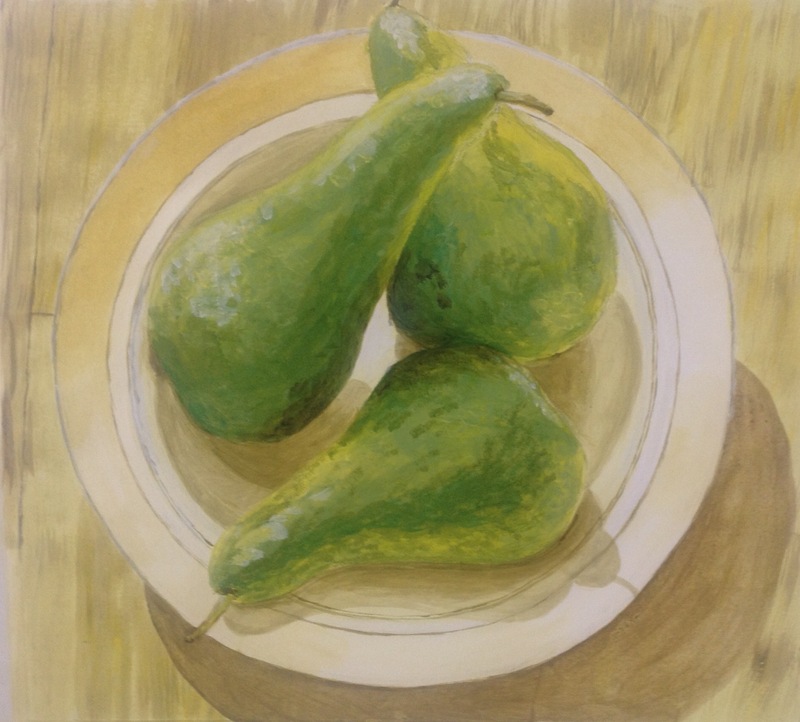 After looking at Caroline Zimmermans painting of pears in oils I chose acrylics to help me get a range of textures, from the roughness of the pears skin to the smoothness of the plate . I also am pleased with the contrast of the bright green of the pears with the yellow/green of the bowl and wood. As it was a bright day again, I was fortunate to have strong shadows which helped give depth to the picture but I am not convinced that I have been able to describe the way the pears rest and overlap each other. Next Article Artists , interiors and perspective.